Dig deep, BULK! The beasts have created a confusing maze of tunnels below Antropolis City. Use your mega 4-legged Drill Machine to tunnel directly towards the Queen’s lair. Clamp down the seat’s armored visor, extend the huge drill and power through the rock. But beware – there are wild jumpers hatching from cocoons everywhere. Shoot the dual flick missiles and flip the drill over to aim the massive laser gun into their path. Then fire your click shooter to fend off this leaping menace. Includes BULK mini robot with a weapon. Last known price is 60% below the initial Lego retail price! The BULK Drill Machine (44025) Lego set is no longer directly available from the sites below. However, 3rd party partners of these sites might still have the set available. 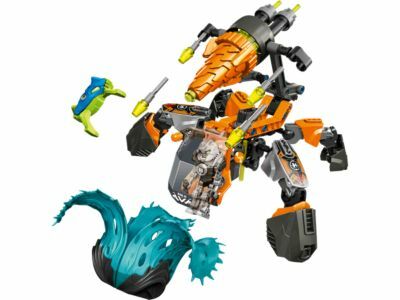 Alternate description Dig deep with LEGO® Hero Factory BULK Drill Machine with drill/laser gun, flick missiles, plus click shooter, cocoon and jumper.